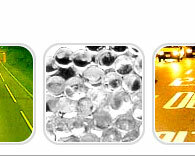 High reflective index glass beads are perfect retro-reflective materials. 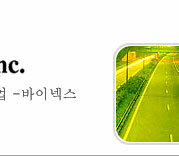 They are widely used for manufacturing reflective sheet materials for Road sign, and they are also used for reflecting cloth, billboard, screen, airport Runways, shining painting materials etc. May be considered as spherical lens and it can returns incoming light to the original light source when reflecting layer is set in its focus point. 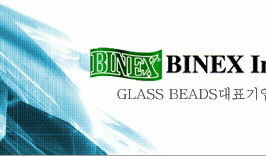 The position of focus point of the glass beads is relied on its reflective Index. Shaped like perfect spheres with a smooth and shinning surface. Remarkable strength, hardness and chemical stability. Reflective index to control it’s focus point. Uniform particle distribution. Made of Tio2, BaO glass, and their refractive index is approximately1.93 No lead, No harmful to human. Milling / Dispersion / Filtration Glass Beads is a spherical glass which is manufactured through a kiln process with low alkaline glass. 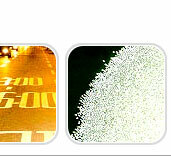 Usually its diameter is 1.0-5.0 mm which is larger than the reflective beads used for road marking. also to pulverize lumps of pigment through mills. Nowadays these so called(when it is used for street improvement) LARGE-BEADS are used for increasing the night-time visibility of traffic line. The quality of glass beads can be classified into two categories :ordinary beads (soda lime) and highly intensified ones (E-glass). The highly intensified beads are non-alkaline, and because of its hardness, it can last up to 3 times longer than ordinary glass beads.